Akron quartet the Singular has been playing and recording since 2007 under the guidance of primary songwriter James Pequignot (drummer Mark Bradbourne, bassist Terry Mortensen and keyboardist Nichole Catalano- Miller round out the line-up). 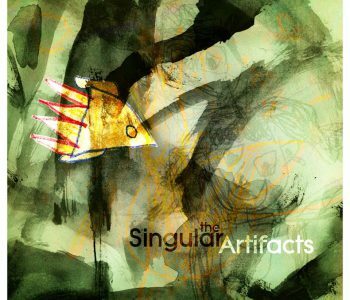 Earlier this month, the band released its fifth collection of original tunes, the full-length album Artifacts , a solid nine- track distillation of Singular’s spacious, melodic, piano and acoustic guitar-driven sound with roots in the ambient ethereal side of bands such as Radiohead and the indie Americana. Recorded at Catalano- Miller’s house and engineered, mixed, produced and mastered at Pequignot’s home studio (he also co-runs the band’s label Diskette records), Artifacts has a more intimate sound and feel than the band’s previous full length, The Sad Machine, which sported a fairly strong OK Computer- era Radiohead influence. One aspect that hasn’t changed is Pequignot’s emotional tone. He doesn’t bother with love songs or political treatises or third- person narratives. His lyrical and musical penchant is for sad or at least sad sounding, songs, with elongated, melancholic melodies filled with existential and spiritual musings sung in his emotional lonesome wail. Pequignot doesn’t write songs about unicorns and puppies or everlasting love, but they come across more like cathartic emotional and spiritual clearing houses rather than just depressed rants. He may be navel-gazing and seeking answers to big questions that folks must answer for themselves, but he is also quite self-aware. The album ends with the Americana flavored Lucky (Rants About Radiohead) wherein our intrepid narrator lays his cards on the table, “I’m sorry for what I am, there’s not much money in sad songs and poetry.” Or rant’s about Radiohead’s rock and roll dominance. But the married singer/ songwriter offers the listener a ray of hope in the form of love: “We hung out on the weekend, Your hair was softer than animal fur, I did not believe in love anymore, ’Til you stole the fear from my spine, And put back the stars in the sky.” Whew, so at least he’s got that going for him, though he probably still could use a hug. The Singular’s music requires some patience as the band takes its time and most of the songs aren’t built on peppy rhythms or immediately catchy melodies. Artifacts , isn’t the soundtrack for most folks’ Friday or Saturday night revelry. But if those same revelers find themselves sifting through shame and regrets and questioning their existence on Sunday morning, Artifacts will make a fine backdrop. Artifacts is available for download at iTunes and bandcamp.com and in physical form at the band’s shows. The Singular make a wonderful sound. 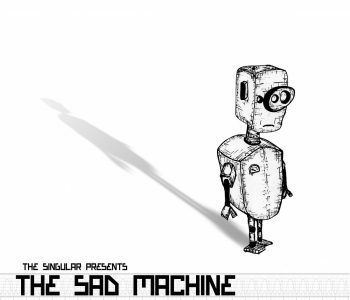 Space like and textural in its atmosphere, The Sad Machine shows the band to have shades of Muse and Radiohead, but perhaps without the rock tendencies of either of these bands, especially in the voice of front man James Pequignot who sounds uncannily like Matt Bellamy. The record edges on being epic with its sound but is let down somewhat by the DIY recording approach adopted in the making of the album, especially on the drum sound. Never the less this is an album packed full of brilliant pop songs that charm and worm their way into your affection. The album opens on the Cocteau Twinsesque Airplane Food complete with effect laden guitar and earthy piano before giving way to the gloriously dark Patience As A Virtue that uses unexpected chord changes to mess with the listeners expectations. The straight forward poppiness of CMF shows the band also has an ear for the commercial and possible radio airplay.The one track that stands out for me is the piano driven The Traveling Salesman Problem. A song that if put in the hands of a good producer could easily break the band in Europe. There is a simplicity to this record that appeals to me. It dark in both lyrics and music. They have managed to fuse different recognisable influences into something, that while familiar is fresh and innovative. The Singular are a band from Akron, Ohio, home to avant-garde legends Devo, as well as my cousin Michael Anne and her family. I would be willing to bet that the band are aware of Devo, but probably not of my relatives. Typical. The Singular are a pop band with a standard four-piece pop lineup. The songs are based around the lyrics of James Pequignot. Let me go over them. Airplane Food gives the album a nice start with a lovely piano riff courtesy of Nichole Catalano-Miller. On Patience as a Virtue, Pequignot tortures his voice like Thom Yorke, so it is not unsurprising that this song reminds me of OK Computer. The Singular mix it up a bit for CMF. The voice is different here: more forceful, less whiney. It’s a pretty catchy song, but then, in the middle, the guitar steps forward with a positively delightful little picked melody, and then the band whistle. This song reminds me of the playful tone of the first Kevn Kinney solo record. One More Machine is another piano tune. The chorus is lovely, with a swelling of strings and the voice kind of Yorke-ishly whiney but buried in the mix with the piano. The Devil’s Two Step is a nervous little song that moves at a cracking pace. I think it is the drumming that gives this song it’s tension, but it helps that the instrumentation is stripped down to just a chiming guitar and angrily thumping bass, while the voice whines and soars. Eventually the song explodes with insistent drumming, horns, and crazy singing. The song reminds me, slightly, of what The Black Heart Procession were doing. Up next is The Traveling Salesman Problem, which is one of the better song titles i have heard in a while. The piano drives this one again, while Jordan Valentine does some understated yet heavy drumming. This song reminds me a bit of The Potomac Accord. Apocalyptic Prelude starts with a mournful keyboard riff and Pequignot singing sadly. Then strings come in, and the band, for a moment, channel Spiritualized. It is only two minutes long, but it has that grandiose, J. Spaceman feel to it. I wonder if it is about heroin? It is followed by When the World Ends, a song that starts with some electro noodling, grows into a strummed guitar piece, and then gets kind of epic, with strings and oohing keyboard sounds. Very nice. Finally, the album ends with Bigger Than You, another piano tune. It is not the best, nor the worst song here, just kind of a slow end to the record. I have to admit that i am impressed. Nothing about my admittedly very limited exposure to Akron would have led me to believe that they had such an interesting band. There is a lot going on here, and The Singular manage to balance dense layered tunes with forceful vocals. This is good pop music. The Singular are a band that refuse to let music simply be a background to our superficial lives. Their debut EP cant simply play in your car, it cant simply be on a TV show, nor can it let any listener in its vicinity simply be. The Singular are not simple, they are deep, require an attention to detail, focus and encourage the listener to “pause their surroundings, reach inside their cold chests and toy with that bloody red organ. Its scary, yes, and music with such intensity is often avoided by those not ready to stare themselves straight in the eye. Largely influenced by post-rock visionaries Explosions in the Sky or Mogwai, this Cleveland, OH three-piece are a true example of a genre done right. The opening cut, “Metal for Breakfast, starts the diverse album off in a dance-y techno fashion before giving way to a catchy, poppy chorus. The lyrics dont just float on the surface, they are as carefully chosen as the music is written. Lead singer James Pequignot passionately guides us through the ambient catharsis and when you arrive at the other end, after the depressingly beautiful piano ballad “Cheer Up, you most likely will be a whole new person, one who understands themselves and the world around them a bit more. Accomplishing this feat with music is groundbreaking and the pleasant consequence of writing this incredible EP. After the first two songs–one robotic, the other slow ‘n’ echoey–I harbored real concerns that The Singular’s debut would be a glum trip indeed. But with the arrival of the third song, all was set to rights. “Nobody” is a real pop barn-burner–more in a Ben Folds way than Led Zeppelin–and an early entry into my Best Songs of 2007. But after a few spins of the whole EP, it emerges that alongside the more overt pleasures of “Nobody,” other songs transmit an equal if subtler heft–the desolation of “An End to Words,” the crunch of “Spiders.” Even the formerly disregarded second song (“Treading Water”) has a tension I didn’t notice the first time around. I Finally Know What’s Good For Me isn’t the feel-good jam of the summer, but it packs more textures into its 22 minutes than most double-disc sets, and it’s ultimately very rewardingly sequenced. We need our winter records, too, and if you’re willing to immerse yourself in its icy depths, this is a good one. This band is the new vehicle for area singer/songwriter James Pequignot, who has a couple of releases filled with his guitar-based compositions. Pequignot’s never been afraid of using mechanized drums, but his new trio incorporates the electronics and atmospheric effects to Pequignot’s otherwise standard songs to better effect. Treading Water also plays up the ominous atmosphere and Pequignot’s ghostly wailing over rolling arpeggiated guitar and electric piano. The six-song EP also contains the groovy electric piano sound that emanates from the Coldplay/Keane piano rock axis, particularly on the Coldplay flavored/potential radio single Nobody. Pequignot’s got a way with a melody and the disc is sequenced so that each song melts away into the next, giving the EP the overall effect of a six-song suite. 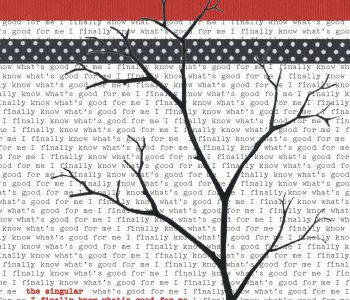 I Finally Know What’s Good for Me won’t be available until mid-February, but it establishes the Singular as a band worthy of attention for alt-rock fans who like the billowy sounds of Travis and Snow Patrol.